It is so hard to believe that Christmas is over for another year. The preparations are always so enjoyable, and occupy so much time - and then when the big day comes, it's all a blur and very quickly finished! We had such a lovely day spent with family - we ate, drank and made merry - and we were all thoroughly spoiled! Since taking the picture I've noticed that I have the cream triangles and tablet shape in the centre a quarter turn the wrong way - but it doesn't really affect the block in a terrible way, so it's staying as is. Apart from that, it's a very cute block. I have no plans for tomorrow, so I see plenty of sewing time ahead of me ... happy days! On Thursday I promised my sweet friend Monica that I would work on a post for my blog that very evening. She'd told me she was stopping by every day to see what was new, and of course there have been crickets chirping at my end. There has been so much going on - you all know how busy this time of year can be - but the honest truth is that most of my 'quilty' doings have been of the 'secret squirrel' variety. I had to completely empty his bedroom, and on Tuesday the 6th, the painter came and made his room beautiful. Then on Friday the 9th the wardrobe installation guy came and installed the new robe/desk combo. I'm just so pleased with how it has come up. It took best part of a week to sort/purge/empty his room, and it took pretty much the whole weekend to put everything away again - and there are still more things to do. I'll share more pictures when it's all done. Camo's so happy with his new more grown-up digs. Some little bits I can share ... I've pieced the backs for some placemats using my 3.5" strips. It feels so virtuous to use up fabrics that might have otherwise sat around for a while :-) The blue strip of fabric there is the binding for some other mats I made a while back and finished recently - they're super cute. And in icky work - the Xmas mat in the background is one I need to replace the binding on. My little man was very naughty and snipped it. Grrr ... but at least it's an easy fix. No Farmers Wife blocks just at the moment, but I've printed foundations for the next two blocks. Hopefully I'll have a few hours just to myself sometime soon! I made one more block this week - and I've since had to move on to other things. Hopefully I'll be able to share pictures on the weekend. I foundation pieced this block - it really makes the process super easy, and super accurate too. I hope to use the same technique for more of them. There are only four more working days until I'm on holidays - once all the Xmas shopping etc is taken care of, I can really spend some serious time in the sewing room. Bring it on!! 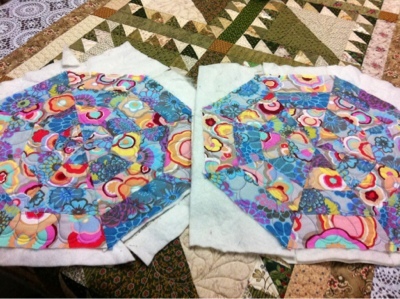 Both simply rotary cut and pieced. Corn and Beans was made much easier with Marti Michell's point trimmer - it really does make it easier to line up the triangles for stitching. Once again - no affiliations, just a very happy customer. The rest of today must be dedicated to getting Camo's room ready for painting tomorrow, so it's unlikely there will be any more stitching for me. He's having a huge re-decorate this week, so hopefully I'll be able to share some pictures on the weekend. Last night I made up Block 18 - Century of Progress from my Farmers Wife project. So, what have I been up to this past week? I'm still working away at the Noah and Friends quilt - I have to finish one more block, and then I can put the top together and add the final borders. It will be a relief when it's done. It's really quite cute isn't it? 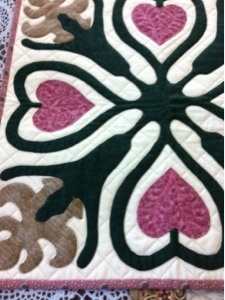 And I've also pieced and quilted about a bazillion (okay - 8) Christmas themed placemats. Hopefully they'll be bound and finished by this time next week, and then I can work on some more Farmers Wife blocks - I'm dying to get back into them. I hope this helps Lisbet - some of the fabrics are a few years old now, but I'm sure it wouldn't be hard to get similar prints to achieve the same look. Just thought I'd quickly share a project that I've been working on, off and on for a little while now. 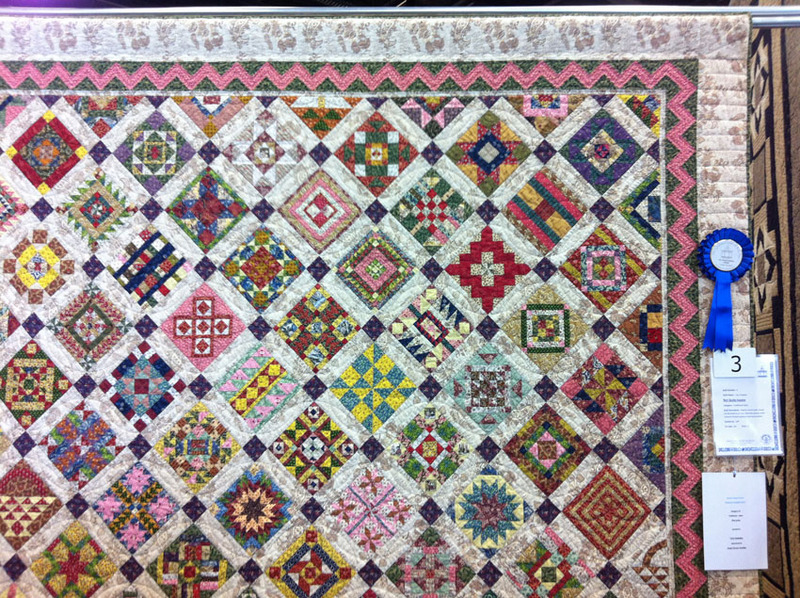 It belongs to a sweet lady that I used to do some quilting for - she brought it to me because she was having all sorts of problems putting the blocks together. 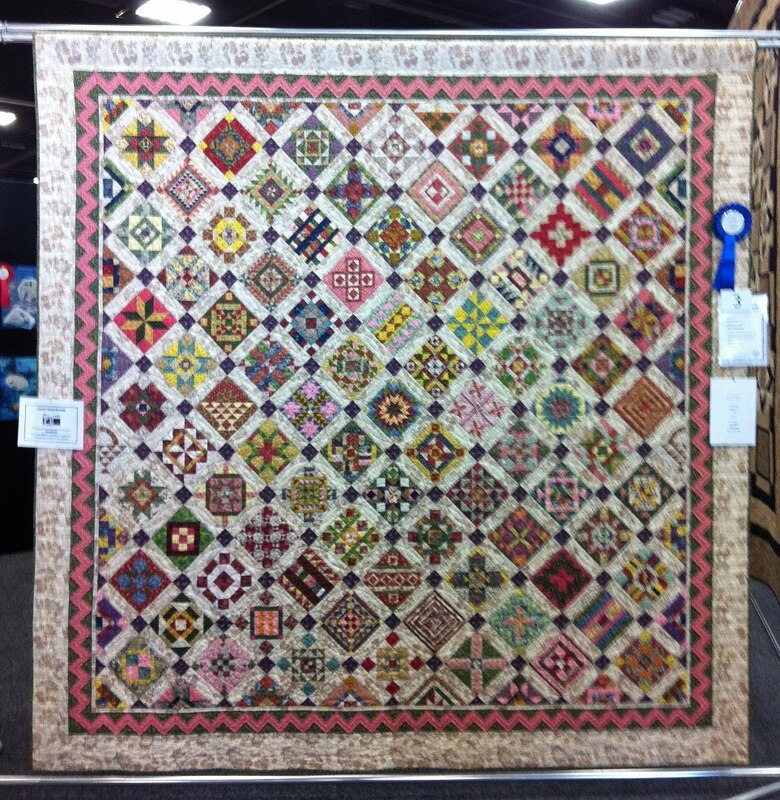 She'd accidentally cut the background fabric squares too small, and just couldn't get the top to lay flat. I've taken it all apart and I'm putting it back together for her - it seemed such a shame to abandon the project, and she'd done such a lovely job with the applique. Isn't it sweet? It's a Kookaburra Cottage block of the month project, called Noah and Friends. I'm really looking forward to giving her top back complete - it's going to look just lovely! Today I MUST work on a whole different project ... I'll see if I can tear myself away ... Wish me luck!! Finally! I spent some of this morning unpicking and resewing this block, before I realised that it was just too far gone and I'd need to start again. I've been working on another project in-between these blocks, so this weekend when I have a chance, I'll share some pictures with you. Tonight I made up two more blocks - they're so much faster than the NI blocks, and not having to make fabric choices speeds up the process so much too! Is it clear that I'm hooked? Oh yes, utterly hooked. These blocks are highly addictive - I've made three more, and I've cut out the freezer paper templates of the next one. I must say, it all looks so much more glittery in real life - I'll have to get Marty to take a picture with his fancy camera and even fancier filter. 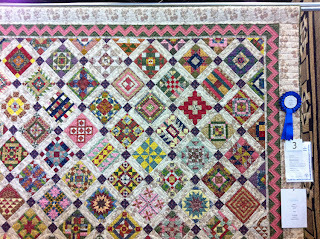 Originally I was going to make my 'Civil War Love Letters' quilt using the colourway I've used in these blocks, but I changed my mind. I think it will look better with a larger variety of colours, so I'll make it in scraps and reproductions some day - lets face it, I still have a LOT of scraps and repro bits and pieces! Having made that decision, I decided to start making 'The Farmers Wife' quilt instead, and I've been dying to get busy ever since. These blocks have been fun to make, and I can't wait to get more made. I've almost completed Block 3 - Basket, it's pieced, I just have to needle turn the handle down. And Block 5 - Bat Wing, I must print the templates before I can begin piecing. 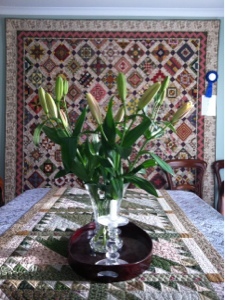 One of my sweet quilting friends gave me the loveliest bunch of flowers yesterday as a big congratulations on my quilty award. Don't they look wonderful? I can't wait for the blooms to open. Thank you Monica! I have been completely unable to settle to a new project since I finished my NI quilt, so for fun I started digging around in my box of orphan blocks. 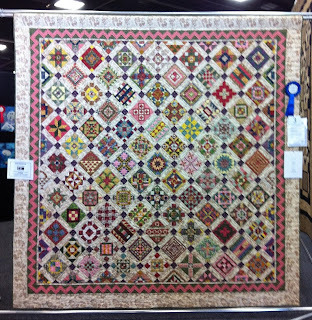 My quilt was one of those selected to represent South Australia at the Australasian Quilters Convention in April next year! Can you believe it?? 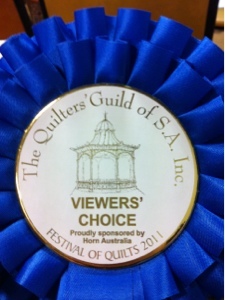 I'm just gobsmacked, and completely honoured! Just when I thought things could not be more wonderful, they just get even better! It is so very exciting! Now that I've had a little time to settle after such excitement, I can begin returning messages and emails - and share news and pictures a little more adequately. Thank you to everyone who has left comments here, and messages on my facebook page, it has been just overwhelming and entirely wonderful. 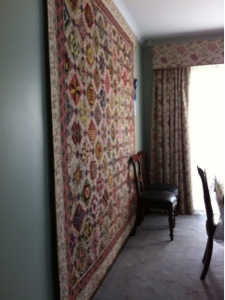 Here is another picture for you - one that shows a little more of the quilt - but still not a good photo. I'm going to visit again on the weekend and hopefully will be able to take some better pictures. 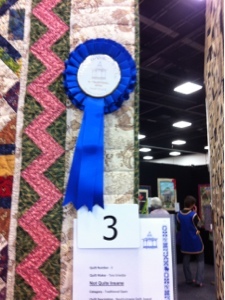 My Nearly Insane quilt won first place in its category at the SA Quilters Guild show, and I'm beyond thrilled. I'm at the presentation now - more later! I've been working on some table mats using some of my favourite Kaffe fabrics. I'll make a couple more and get busy binding.